Saturday was a fabulous day. It was the first day in ages that I was able to do some very needed work in the garden. For a change the weather cooperated, and my lately very complicated life cooperated to give me hours and hours to garden. What I was finally able to do was some overdue cleanup from this winter. I cut back freeze damaged branches on the hydrangeas, cut back the green shell ginger, and worked on the patio bed. Most of my time was spent on the bed surrounding our back patio. This past winter, which was unseasonably cold for us like it was in so many areas, actually did me a favor by killing things back. 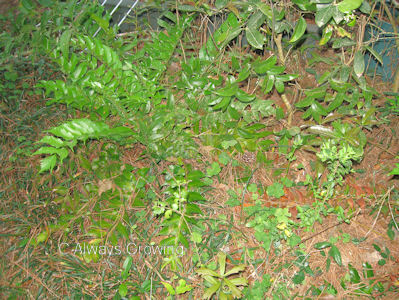 There were several plants that had just grown too much and were taking over too much area. When things are growing for several years, it is often so easy not too see that they are becoming too big and need to be cut back. I do have a problem cutting things back especially if they are in flower. With certain plants, I have got to learn to be ruthless and not just do a little trimming. One plant that had taken over was the creeping Mexican petunia. I did pull up some last year that was encroaching into other plants, but I should have never let it get as large as it did. This winter killed it back with just a few plants starting to come back. After cleaning out an area about three feet by three feet, I am determined not to let it spread that much again. 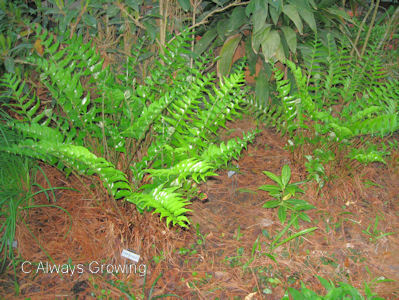 The next group of plants that I tackled was the holly ferns. This is where I spent most of my time, cutting out the old, damaged fronds, so the new ones would show up better without the brown or yellowing ones around. I filled two 50 gallon trash bags with the old fronds and put them aside to use to refill the compost bins. 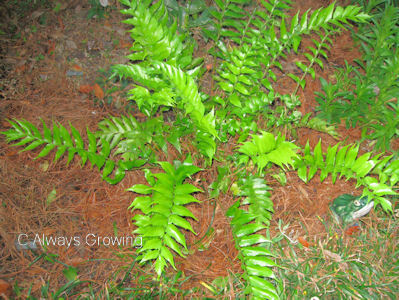 After cleaning up the holly ferns, I realized they were not as big as I thought. I had seriously considered moving some because they were crowding other smaller plants. Now, I won’t have to – time saved for other tasks. There were a few bright spots I found as I cleaned up this area of the garden. I found that the Blue Daze is coming back. After I trimmed away the dead stems, there were several stems with green leaves showing. I am so glad I didn’t just yank the plants out. When I pulled away the mulch that I had hastily placed just before a severe freeze, I found several cannas already sprouting up, as is the night-blooming jasmine. While working on this particular bed, I did make some decisions about its future. I think I am going to make it less work by moving some plants to other areas of the garden and using more mulched areas here. There seems to be too much in this bed. 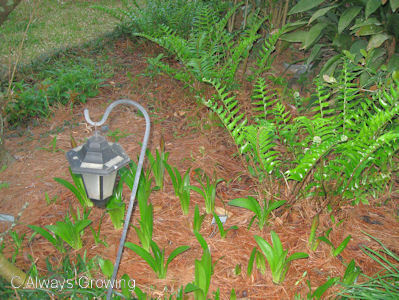 I am thinking about removing the daylilies, sages, and the Triumphator lilies and having this area mainly holly ferns, hostas, and amaryllis. I think this will make a little less maintenance work and give a neater, more serene look which would be nice next to a patio where we like to relax. All in all, it was a great day in the garden. Because winter lasted a lot longer than normal, I knew that once warmer temperatures finally settled in, there would be a huge burst of spring in the garden. Sure enough, things are popping up all over, making up for lost time. 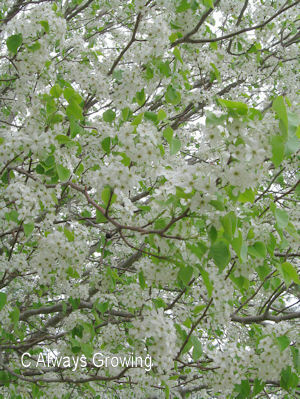 Last Sunday, we were at my daughter’s house, and her Bradford pear was in full bloom. Our ornamental pear was just about finished blooming, but hers was gorgeous and really stood out against the gray, cloudy sky. The daffodils finished blooming this week, but the petunias are finally flushing out after being flowerless for months. We haven’t had any real rainfall lately, so I have had to water a bit. While doing that chore this afternoon, I notice many plants are starting to return after such a cold winter. The gingers, cannas, and hostas are starting to show growth. Several plants have surprised me by coming back after such a cold winter. I still can’t believe the variegated shrimp plant that was out in the garden with hardly any mulch is putting out new leaves. I though surely it was a gone for good. The day-blooming jasmine is putting our new growth on its stems which did surprise me since the night-blooming variety always dies back to the ground. I thought surely that one would die back completely, too. Another plant I thought was dead was the “Red Sensation” cordyline I had planted in a large container. When I bought it, I was told it was hardy in our area, but this winter it died. Or seemed to and I was so disappointed. Today, however, I noticed a sprout coming from the base. Yea! It’s alive! There are several favorite plants I am still holding my breath on. Only one of my Chinese hibiscus is sporting a leaf. The others – nothing. I have scratched the bark and have seen green, so I am still hopeful, but I am concerned because the stems look so bad. I think the oyster plants I put in last summer are not going to come back, but I won’t give up all hope until May. There are always a few plants that take a long time to come back. The Mickey Mouse elephant ear is also a worry. My sister, who lives in a warmer area than I do, feels she has lost hers, and I can’t believe that mine would survive if hers didn’t. None of the other elephant ears are up, so I won’t know for a few weeks if mine is definitely dead or not. This waiting to find out what did or didn’t survive our extra cold winter certainly has me on pins and needles. It is hard to be patient when you are unsure if you will have to replace plants or not. Even with the small setback of colder temperatures this past weekend, spring is still marching onward. 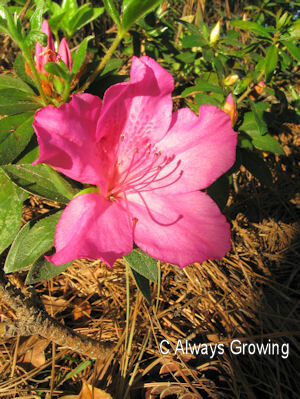 The first azalea flower has popped out. Now, this is the only one so far, but the azalea buds are swelling, and it should not be too very long before there is that gorgeous burst of color that only azaleas can give. This year they are going to be blooming a little later than normal, but that’s okay. Maybe they will be around for Easter this year. Spring arrived yesterday at 1:32 pm (EST), and today, the first full day of spring was so unspringlike. The last week has consisted of warm, sunny, mild days, but now that spring is officially here, it is cold and windy. Today seemed like a late November day. Our low was an unseasonably 37 degrees, and the highs never got out of the mid 40’s. Combine that with the wind, and today felt as if the temperature was in the high 30’s. What a first day of spring! Even though it was an unusually cold day, there still is proof that spring has not retreated – the summer snowflakes are blooming. These little flowers are among my favorites. I love the small white flowers with the green dot at the end of the petals. 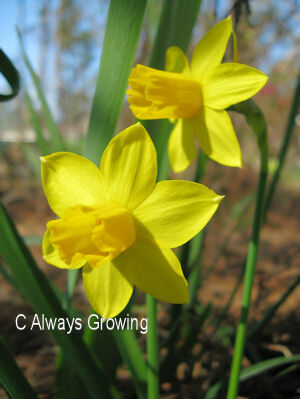 We often think of daffodils as being the spring bulb, but for the Gulf Coast, where many bulbs will not repeat bloom because of our mild winters, these are great, dependable bloomers. A sure sign of spring around here. It always amazes me when new plants just “show up” in the garden. I am referring to the ones I have never planted or owned and not the ones that just may move from one area to another. Over the years, I have had many volunteers arrive and have always wondered where they came from. One year, a cigar plant (Cuphea ignea) showed up, and I never have planted any. A daylily appeared about four years after I had removed some from the garden bed, so I guess it came from the original plants, but, still it was a surprise to see it just seem to appear. I have had banana trees and old-fashioned cannas show up, too, none of which I had planted. One of the more recent arrivals have been the little white violets. We have had the occasional light purple wild violet for years here and there in the lawn. I know where these white ones came from – our neighbor across the street has them in her lawn. But they only showed up there about three years ago. Where did they come from? The first time I saw white violets was many years ago, and it was miles away from here. I guess they are gradually moving around. 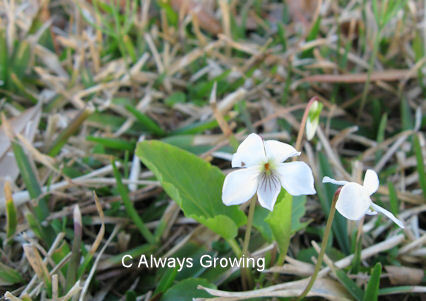 I know many people do not like the wild violets in their lawns, but with our thick St. Augustine grass, we haven’t had any problems with them taking over in the thirty years we have lived here. The white ones are a welcome change from the “regular” color, and it is nice to see them even if many consider them a weed. When springtime finally comes around, it certainly can move fast. Before you are prepared for it, it is already time to say goodbye to some spring-flowering plants. Just as plants can surprise you with their flowers showing up in what seems a sudden manner, they can also leave just as fast. 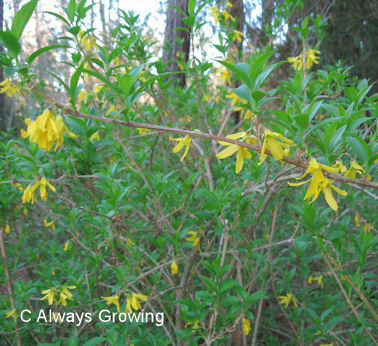 Case in point – forsythia. It seems like it was only yesterday that the flowers started appearing, and now the last few blossoms are barely holding on among all the new green leaves. Now that the yellow of the forsythia is fading, there is another plant ready to take over the job of displaying beautiful color. 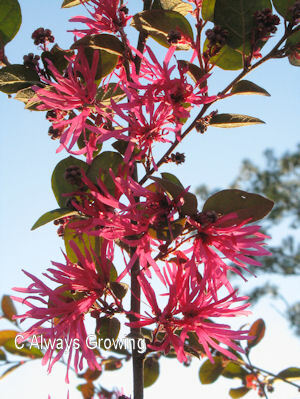 The loropetalum is now in full bloom. I have several of these bushes on the north side of our property. A gardening friend tried to get me to plant some many years ago, but I resisted. Foolish me. When I finally put three bushes in and saw how well they performed, I went out and bought more. I wish I would have listened to my friend when she first told me about loropetalum, because, by now, I would have a nice screen of flowers to separate me from the neighbors. I like that the flowers are so different. 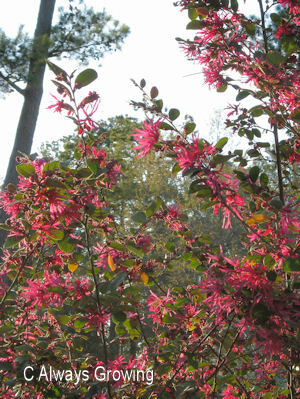 Close up or far away these are great flowering shrubs. When it is time to say adieu to one spring-flowering plant, it certainly is nice to be able to welcome a new bloomer. A visit from my sister who lives in Virginia and a big birthday weekend have not given me much time to garden or blog. I will have a lot of catching up to do in the next few days. It seems like every day there is something new showing up or blooming in the garden. This is how gardening is supposed to be in the Deep South. Extended cold periods and just about everything brown is really unknown to us. 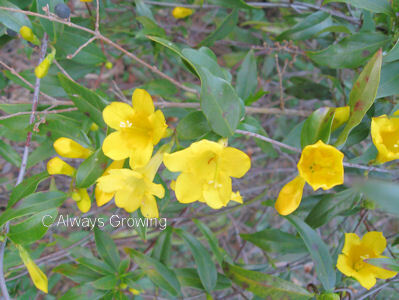 The Carolina jasmine has started blooming. 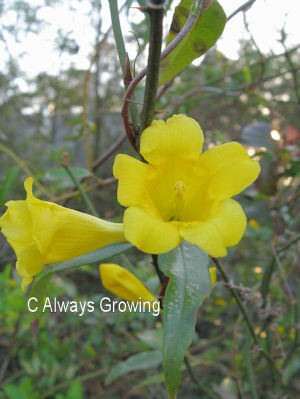 It is not only the bright yellow flowers that I like about this vine or the fact that it blooms so early. What I really like about this plant is how all of a sudden it just bursts into bloom. It seems like one day there is only leaves and the next day – Bam – flowers all over. 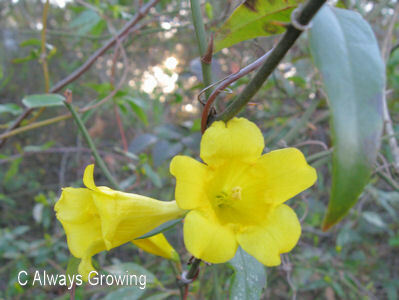 The only down side to this lovely spring-flowering vine is how short the bloom season is. I wished it would have those spring yellow flowers for a few months rather than weeks. Every day there seems to be more and more early signs of spring approaching. 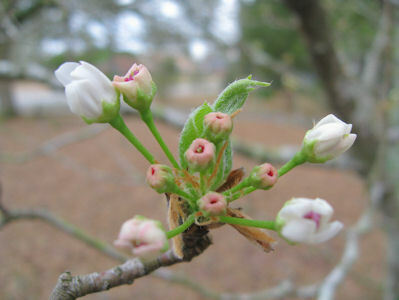 Today, the ornamental pear tree’s buds showed that it won’t be too long before they unfurl their petals, and there will be the spectacular show of white flowers. It has been years since I have been longing this much for spring. Even though spring does not officially begin until March 20th, with our temperatures in the high 60’s and low 70’s and flowers starting to pop out, it looks like spring has arrived here a little earlier than the official date. The old saying really is true. A picture is worth a thousand words. I don’t think there are any words I can add to this photo of such a lovely sight. After record cold, record rains, and record cloudy days, the last few days have been a great improvement, and to top it all off, the first spring flowers showed up. The camellias have been blooming, but they are really winter flowers. 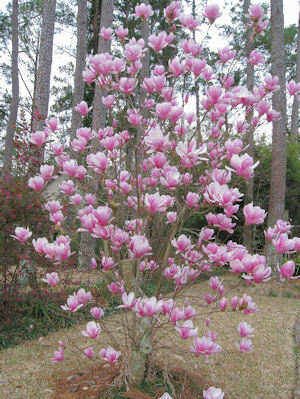 The forsythia, quince, magnolia and peach trees are just starting to bloom, but those are trees or shrubs. It is when the first garden flowers show up that it really feels as if winter is over. 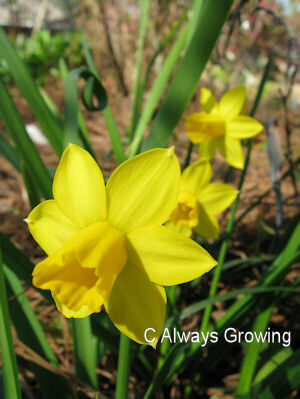 For me, that means the Tete a tete narcissus have started opening. 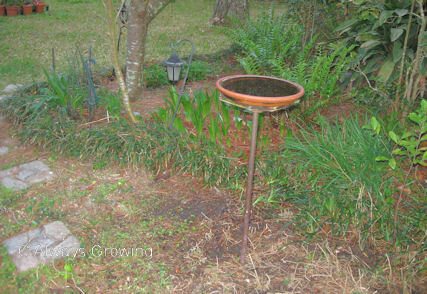 I checked the garden Thursday, and there were no little yellow flowers showing. Then, on Saturday, I saw clusters of them. To say I was elated to see them is an understatement. The last few days, while still being in the low 30’s overnight, have warmed up to our more normal temperatures, and I am sure this is why the flowers have so quickly popped open. 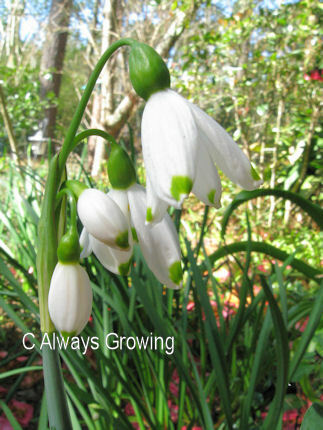 I have stayed with the small flowered narcissus because the large flowered ones do not always repeat bloom well here, and I don’t feel it is worth the effort to prepare a bed, buy the bulbs, and plant them if they will only give one year of good blooms and just a few in subsequent years. The small ones suit me just fine especially after a long, cold, dreary winter.